Today I’d like to tell you the story of two people shopping at grocery stores for some chicken. One person runs through the grocery store quickly buying the items he needs (including chicken) and gets out of there paying little attention to money. The other person takes a little more time, not a lot, to pay attention to any particular deals. We are going to focus on their chicken purchases today. We’ll call them Rich Chicken and Poor Chicken*. I’m going to play the part of Rich Chicken, the person who spends a little more time to find the deals. Last week, Rich Chicken found the chicken deal of lifetime! Even though his wife had warned them that they had too much chicken, Rich Chicken does what Rich Chicken does… buys chicken. You can click on the image for an even bigger one to get the details on the pricing. Pay no attention to the dates, I’m writing this article long after the chicken had been frozen in our chest freezer. The sell-by date was the next day. The big picture (pun intended) is that each of these packages of chicken are on sale $5 off… and they are only around $7 to begin with. I’ll give you the details so that you don’t have to squint on that picture. Before the discounts on the packages I would have spent a total of $21.35 for 14.33 pounds of chicken in the three packages (including the devil chicken package at the bottom). That would have been $1.49, which is a great price for boneless, skinless chicken breast under normal circumstances. After the $15 in discounts ($5 per package), I spent $6.35 for 14.33 pounds of chicken or around 44 cents a pound. Now let’s look at Poor Chicken. Maybe he’s in a rush (aren’t we all sometimes? ), but let’s presume he’s just not mindful of his shopping spending. Maybe he’s got a bunch of other things on his mind. For whatever reason, he doesn’t see this chicken deal in plain sight. Many other shoppers missed the deal as well. There were plenty of packages available that I didn’t buy and I waited a few extra minutes to see people pass it by. A couple of days of later, Poor Chicken decides he wants chicken for dinner. Unfortunately now, he’s at a different grocery store. This chicken isn’t on sale. Typically, I see boneless, skinless chicken at $2.99… more if it’s organic. He might only buy a pound or two now, so it isn’t that big of deal. However, let’s assume that over some time he buys (the convenient amount of) 14.33 pounds of chicken. Poor Chicken spends $42.85, while Rich Chicken spends $6.35. For some people that $36.50 isn’t that big of deal. This is an extreme example as well. However, all these mindful shopping decisions add up. I can’t even begin to estimate how much that is when you multiply it across many shopping trips over a lifetime. There’s a lot of debate in personal finance about whether it is better to make more money or save more money. I think there’s room for both. A penny saved is a penny earned, which is a penny that can be invested. * The story, all names, characters, and incidents portrayed in this production are fictitious. No identification with actual persons (living or deceased), chickens, places, buildings, and products is intended or should be inferred. Wow! Great job of shopping. I generally scout out the best meat/poultry deals I can find when I go shopping, but this one beats anything I’ve found so far. This is the best deal I’ve found too Terri. I wasn’t even shopping for chicken, but I figured I’d just do a walk-by just in case. We just did this deal! In our case it was 50% off. 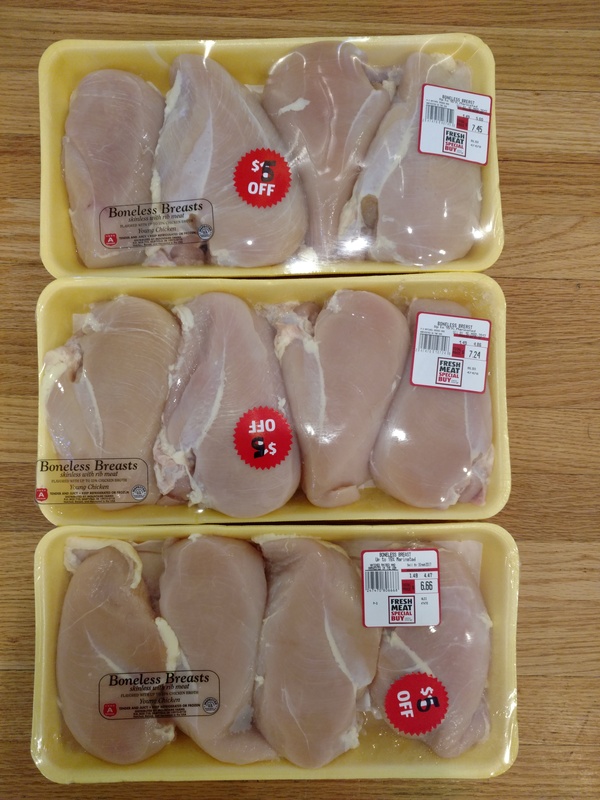 Same chicken breasts from aldi already priced at a ridiculously low 1.49/lb. I think I bought 4 packages, so about 20-25 pounds. Also bumped into another local FI/PF blogger in Aldi and keyed her into the deal. I felt like a thief walking out of there. A whole trunk full of meat for $10-15 I think. Kind of made me want to buy a deep freezer. I recommend a deep freezer. It’s a one-time expense with the exception of electricity, which can’t be that much. I felt like a thief at Aldi this time. I was originally going to title the article “How I Robbed Aldi”, but I didn’t want people to take it too literally. I think we would run into freezer burnt food if we got a deep freezer. As is, I’m already finding 4-5 month old meat at the back of the freezer and we have to stay on top of it to keep the stock rotated. I figure I’ll find these steals on meat often enough to restock every couple of months. I usually hit up 2 grocery stores in a week and always check the meat area to see if there’s a big clearance sale. One of the best uses I’ve found for boneless, skinless chicken breast is to put it in a slow cooker with water for about 8-9 hours. Then it pulls apart perfectly. Boiled chicken may not be the most flavorful for us humans, but dogs LOVE it. A little goes a long way with dog food. Thats a lot of chicken, but also a great deal. I’m seriously getting jealous of all you folks with access to Aldi. We tend to search for these deals as well, though its a fine line. It’s just as easy to go overboard and spend more time searching for the deal then its worth to you. Its a balancing act. Great deal you got there. My local Save a Lot usually marks down their meat on Saturdays. Always 50% off. I routinely pay about .50 a lb for chicken. We prefer dark meat. We get legs and make “jumbo wings”. We also get beef and pork as well. The meat is cut in store and I repackage into portions for two. Rarely do we pay full price for meat.